Everyone wants to be successful. For some, success is found in strong relationships. For others, it's accomplishments or influence. And of course, few of us have a definition of success that doesn't factor in finances. There is certainly no shortage of material dedicated to helping us achieve any number of "successful" lifestyles. Typical offerings include generic action tips like "do what you love" or "overcome obstacles," as well as generalized principles such as "it's all about who you know" and "the best rise to the top." Unfortunately, success isn't as simple as persevering at something you love. That may be what we all want to believe, but there are some hard truths and hidden secrets to this thing we call success. In 20 years, you will have an entirely different definition of success than you do today. Doubtful? Think back 20 years (or even 5 or 10), and remember what success meant to you then. As we grow, our values, priorities, expectations, and dreams evolve. As we accomplish our goals, we find that they don't quite satisfy us like we imagined. As we enter new stages of life, we find ourselves enjoying and desiring different elements of life than we did in the previous season. Focus on enjoying the journey. Investment in the future is good, but if you sacrifice everything today for what you think you'll want tomorrow, you might find your prize less than rewarding. If you want a shot at massive gain, you typically have to risk massive failure. Alternatively, if you are willing to pursue more modest gains, you only have to take modest risks. Many of history's millionaires went bankrupt before hitting it big. In fact, if you look at a collection of rags-to-riches stories, you'll find that hard work and the willingness to lose everything are common threads. If you play it safe, you'll never have outlandish stories to tell your grandkids, and for many of us, this is perfectly okay. But for those of you with a craving for greatness, the deciding moment will probably come down to a decision between hedging your bets and risking it all. You might just find yourself on that elite list of incredible financial successes, or you might fail and lose everything. This is a hard truth everyone knows, but few want to state explicitly. Many wealthy heirs make the decision to risk millions of dollars per the previous point. Think of Rupert Murdoch or Ted Turner, who turned inherited media businesses into world-renowned empires. For them, failure meant a trip back to the trust fund. For you, it's probably rice and beans and a housing downgrade for the next year. The easiest way to make money is simply to have it. The banking industry yields the highest returns on the market because it controls the money. The richest among us pay a lower percentage in taxes, because their income is almost entirely capital gains driven. For the average citizen, attempting to make it big is like showing up to a high stakes poker table with $500. You probably can't afford the losses required to eventually land a win. If you have a big financial dream, understand that your best chance at success lies in surrounding yourself with financiers or taking risks while you're still young enough to afford it. Investing your five-year savings in a startup at age 26 might be your best bet at becoming a millionaire. Trying the same thing at age 40, when you have a family to support and big bills to pay, is probably not the best idea. There is no shame in understanding what you do and do not have to work with. Many of today's sugarcoated career guides will tell you to just do what you love and you'll end up wealthy. That may be what readers want to hear, but doing what you love will only make you wealthy if you love (and are good at) doing stuff that earns a of money. This is where your personal definition of success comes into play. I could be making a nice salary as a staff accountant for a Big 4 accounting firm right now. Or I could be making zero dollars pursuing a professional basketball career. Instead, I'm scrapping it out as a writer and entrepreneur. Why? My personal definition of success has far more to do with my day-to-day life enjoyment than my year-end bank account. I do, however, believe I can make good money as a writer with a concentrated effort towards mastering my craft, but I also know I have a one-in-a-million chance of ever matching the profits of a public accounting career. The point is, I understand that all my passions aren't created financially equal, and I have selected a passion that merges both personal enjoyment with profit potential. Of course you should do the things you love, but understand what your profit potential is. I once thought reading "how to be successful" stories from rich people was a fantastic idea. But I quickly learned that few, if any, journeys are repeatable. I probably won't buy a plot of land that contains millions in oil reserves, thereby funding my numerous award-winning startup ventures. I probably won't happen upon a billion dollar social media idea in my college dorm. Rags-to-riches stories are typically the result of hard work mixed with a heaping portion of luck. Trying to copy someone else's journey is like asking that genetic prototype at the gym for workout tips. What works for him will not work for you. If you want to learn from past examples, try learning from people's failures. Failures are often far more easily repeated than successes, but they are just as easily avoided if you watch for the snares that have tripped others first. You can also take away principles from people who have repeated success over and over. A serial entrepreneur will have much more applicable advice to offer than a lottery winner. And just remember that new success stories are constantly being written. There is always a new trail to be blazed. If you want it, go get it. Ultimately, no one but you can decide what you will or will not accomplish. The rules apply to you until they don't. For every lucky success story, there is an individual who simply would not take no for an answer. Life is yours for the taking. You may not start with odds stacked in your favor, but you are only as limited as you allow yourself to be. Embrace the truth, and then render it irrelevant. 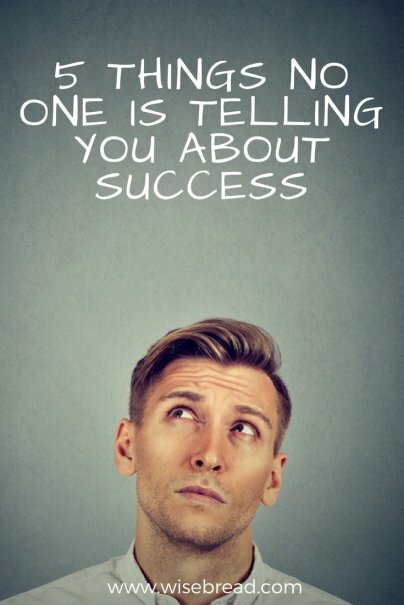 What have you learned about success that no is telling? Please tell us in comments! Yeah, that's a bummer. It would be nice if it wasn't true, but unfortunately, some passions simply aren't profitable enough to earn a living.